HCA (hydroxycitric acid) is a close relative of citric acid, the agent that gives citrus fruits their characteristic tart flavor. 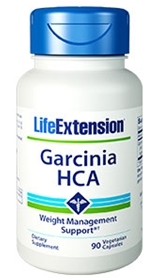 HCA is obtained as a 50% standardized extract of Garcinia cambogia, a small fruit from southern India, where it has been used for centuries as a food preservative, flavoring agent, and digestive aid. When calorie intake exceeds the body’s energy needs, the excess glucose is converted into glycogen, which is stored in the liver and muscles for future conversion into energy. Weight gain occurs after the body’s capacity for glycogen storage is reached. At this point, glucose from excessive calorie intake is converted into acetyl coenzyme A via a metabolic pathway involving the enzyme ATP-citrate lyase and then into fat molecules, which are stored in fat cells. HCA exerts its weight management effects by binding to ATP-citrate lyase. This reaction limits the conversion of carbohydrates into fat through an enzymatic process. Studies show that HCA suppresses appetite while giving the sensation of fullness, which may contribute to weight management. Many HCA products on the market today do not adequately assimilate into the system. However, Life Extension’s HCA is formulated to ensure maximum absorption. Supplements are to be taken in conjunction with a healthy diet and regular exercise program. Results may vary. Take one capsule three times daily with one capsule CitriChrome, 45 minutes before meals. HCA bioavailability was found to be significantly higher in fasting individuals as compared with subjects consuming HCA in conjunction with food. HCA is best utilized when taken with chromium.